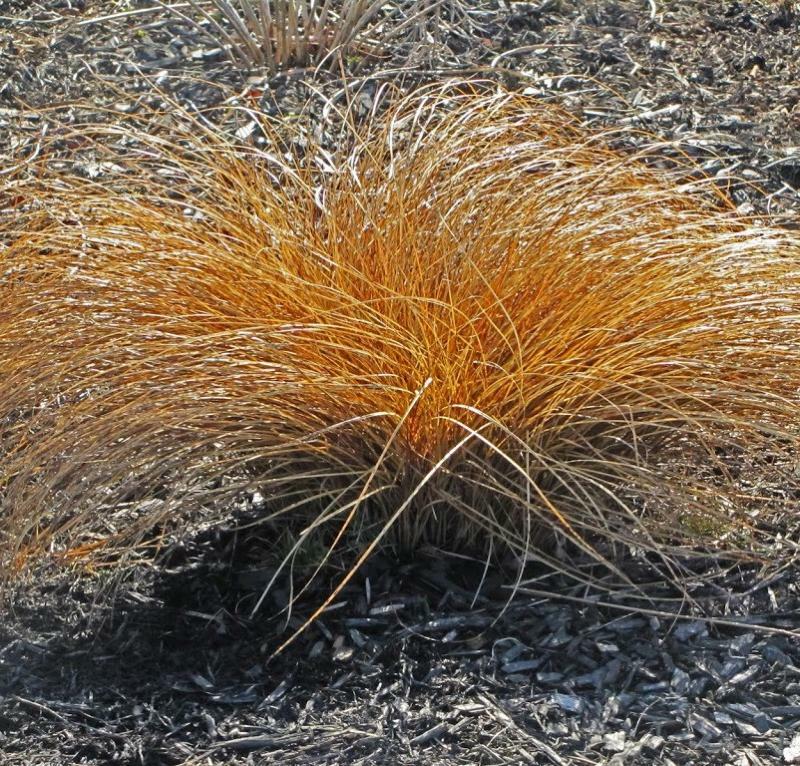 Carex secta tenuiculmis is perhaps the finest of the New Zealand sedges with very persistent evergreen foliage that seems to change colours with the seasons, and taking on an almost orange effect during the autumn and winter. 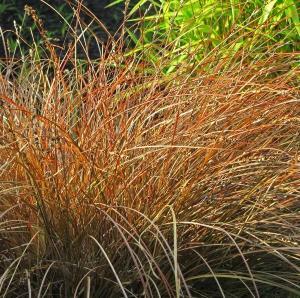 As a young plant, the coppery fine-textured leaves of Carex secta var tenuiculmis are tufted and erect in growth. As it matures, the upright leaves arch over to the ground. Growing 35 to 50 cm tall, the high arching clumps are very attractive and at their most effective when planted quite close together. Hardy, low maintenance and evergreen, it can be grown in full sun or part shade. When grown in full shade, the leaves appear a more reddish-green colour. 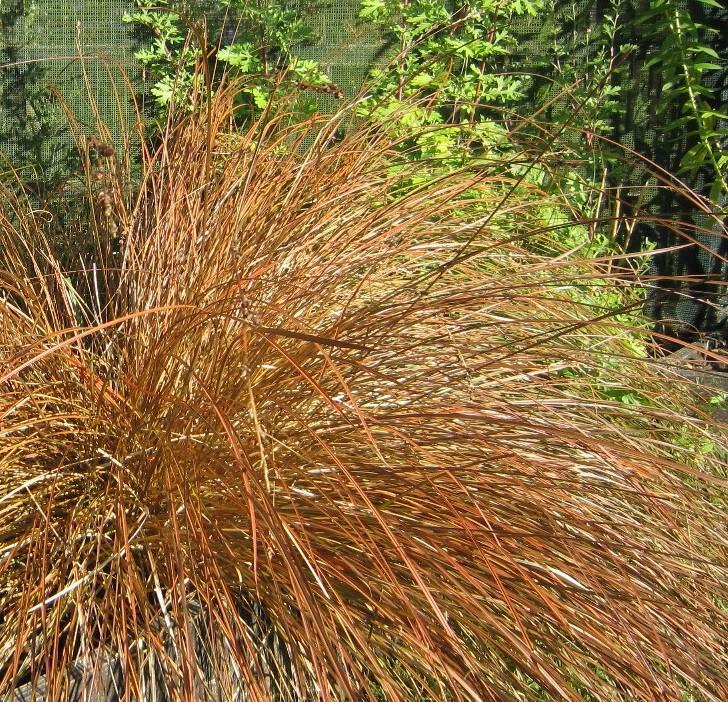 Carex species have long been popular with garden designers because of their colour and especially their form. 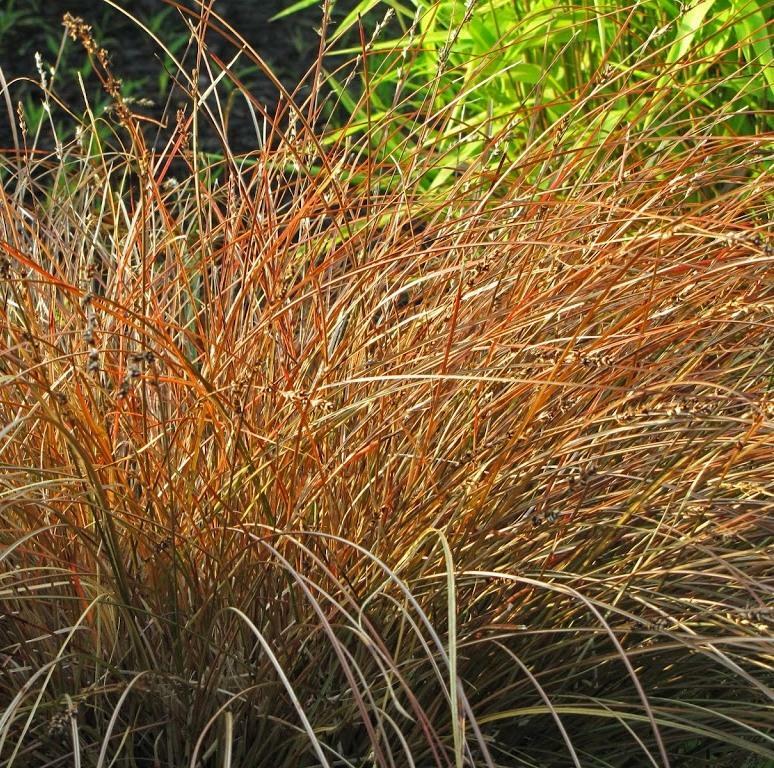 This sedge will quietly enhance any landscape for many years with minimal care. This is an all round tough plant, suitable for problem areas and quickly becoming established in borders or containers. It is extremely versatile with regard to soil type, tolerating dryness, salt winds and sandy drought-prone soils and yet will adapt to quite moist situations and is hardy to at least minus 10°C. It is disease and pest resistant and evergreen, and will provide valuable winter interest to the garden. Easy to grow in most well-drained fertile soils. Will not tolerate excessive winter wet, and avoid extremes of wet and dry. Soil can be well-drained or moist and well-drained, and acid, alkaline or neutral, sand, chalk, loam or clay. Uses: This variety is outstanding when planted with silver foliage plants, brightly coloured flowers or variegated grasses. They give colour, texture and movement in the perennial garden. They also look good as a specimen in a pot or planted informally in groups of 3 or more, dotted among herbaceous plants and ground cover. They are at their most effective when planted in groups or in show-stopping block planting schemes. Pruning \ Aftercare : Mow clumps occasionally to rejuvinate plants.